You have your best buddy and you love him, the moments you have together on your strolls can be a great bonding time. The relaxation achieved when you are out together can be second to none, the unconditional companionship is priceless. In unfortunate circumstances when your best friend cannot walk for any distance, or for long periods at one time – you need not automatically turn your back on your favorite shared pastime. There are dog strollers aplenty and they come in all shapes, sizes, and designs so you are sure to be able to find an ideal one for you and your best friend. Are you looking for a dog stroller? First timer or in need of a new one? You've come to a great place to find one. In this update, you will find the dog stroller that you are looking for even easier because we linked each from its review to exactly where you need to go. In addition, we enhanced the readability, and as always you can find useful information for what type of dog stroller to get, other features and see some answers frequently asked questions. The size of your dog will, of course, determine to an extent what type of dog stroller is better for your needs and individual requirements. The huge array of specialist strollers mean you and your dog can continue to enjoy the favorite shared pastime without stress or pain. They are designed in part, similar to baby strollers, but of course, there are fundamental differences that ensure your dog will be safe and comfortable on your strolls out. They are also increasingly being adapted to encompass user comfort and convenience too – so you don’t have to suffer from aches and pains whilst your pooch travels in luxury. This review will check out the best ten dog strollers to give you a bit of a head start when you’re on the quest to find the best stroller for your best buddy. The top three recommendations are placed as such because they have individual features that make them stand out, and the remainder offers a broader variation on choice. There may be various reasons for you deciding your buddy would benefit from a stroller, but ultimately you need to take into considerations such as weight and comfort. The following key points and full review will give you a starting point at least so that you can make the best choice for you and your dog. 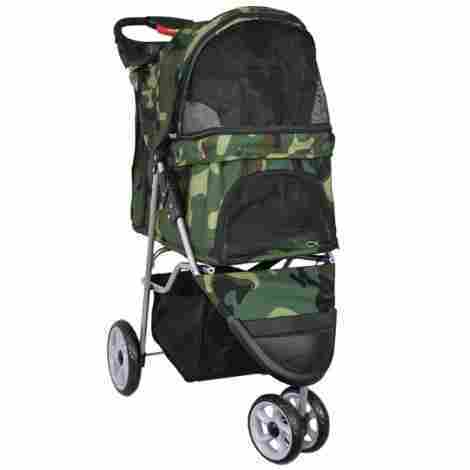 The VIVO Three Wheeled Dog Stroller is available in four appealing colors; black, camo, green and red. The compartment is large enough to provide a comfortable ride for dogs with a weight of up to 30 lbs, and benefits from easy zipper access. This attractive dog stroller has two chunky rear wheels and a durable double front wheel for optimum steering. It has a mesh window to the front to allow quick viewing, as well as one on the top of the hood and allows air and light to enter the compartment, this also is a benefit for the dog because it can reduce stress caused by being in confined spaces. This practical dog stroller boasts two cup holders, a center tray and a really useful undercarriage basket for safe storage of personal effects on any journey. The quick release mechanism includes two easy to use latches on either side and as a boost, both wheels have brakes for added safety when stationary. The stroller benefits from a padded handle for comfort when pushing, and the easy three zipper makes of access makes using it a breeze. The interior also features a padded bottom for extra comfort of the dog, and this stroller is completely collapsible for easy and quick storage when not in use. Overall the VIVO Three Wheeled Dog Stroller offers a practical, cost-efficient way to carry a favorite pet on a daily walk. The ease of use and full functionality make both cost and value equal, the extra features that provide comfort for the pet and its human ensure this is a great product. 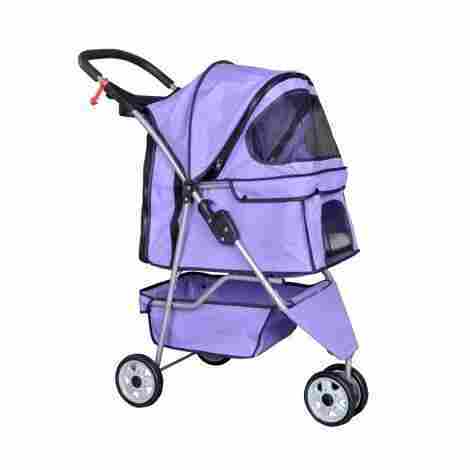 The stylish Paws and Pals 3 Wheeler Elite Jogger is offered in an attractive design in two colors; blue and purple. It boasts being HD lightweight and guarantees GB14748 Stroller Safety Standard and is manufactured under the GB/T2161 Production Standard – so user and pet safety is at it’s optimum. To add further to the safety features, it also benefits from seat belt leash holding, and to top this, it has double brakes on the substantial rear wheels. 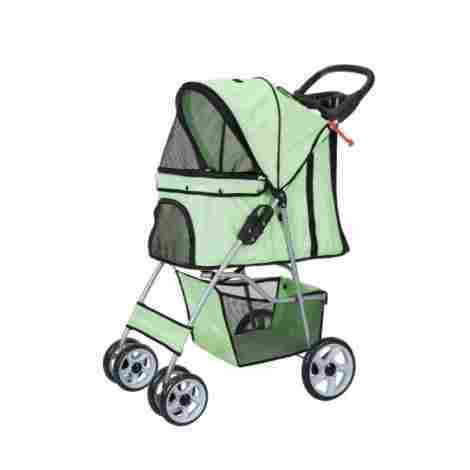 The stroller has mesh screen windows for easy viewing for both pet and user, the mesh also provides protection from potentially harmful bug bites and irritations. It boasts both front and rear access which enables ease of use from any angle in comfort. The Paws and Pals stroller has ample storage for both pet and human, with two handy cup holders and a more than substantial storage undercarriage. The whole unit folds easily with a useful single hand mechanism, and it has the added benefit of a fully retractable waterproof rain hood. The Paws and Pals 3 Wheeler Elite Jogger is both reasonable on price and overall value. The lightness of the stroller and easy collapsing method; with the easy storage give this stroller a definite edge. The safety harness and safe breaking system add to the overall value of the unit, and it is an excellent buy. This six-wheeled dog stroller benefits from having no tricky zippers to contend with making it easy and convenient to use on a day to day basis. It is available in three contemporary color designs; boysenberry, jaguar and pine green. It weighs in a mere 13 lbs and can comfortably carry a weight up to 35 lbs. The plastic/EVA wheels are 6 inches in diameter and are set as single units to the rear and two double sets to the front. It boasts a fully removable liner for better hygiene and there is the added option to purchase the weather cover for those inclement days out. The stroller is manufactured with a sturdy metal frame and has a paw-friendly elevated rest area. The water-resistant canopy is a handy addition for those days when the full weather cover isn’t practical to use. It has the benefit of a full mesh screen so the view is fully panoramic and enables a quick glance to check on the well-being of the pets. This product offers substantial storage which includes an undercarriage storage basket so there is plenty of room for all the pet and human essentials when out and about. The comfortable handle makes steering with the swivel front wheels a breeze no matter how long the day's traveling is. The overall cost and value of this Pet Gear No-Zip Happy Trails Lite stroller is well balanced when the quality and exceptional features are taken into account. The functionality and practicality of the whole stroller make it both easy to use, keeps the pet comfy and safe and is smooth for the user. This great value PetLuv Soothing Happy Pet Premium is a three in one product for ultimate choice, it is a stroller and a carrier in one, and benefits from a detachable carrier for a more comfortable ride to the vets. It offers a large space that is soft sided and has mesh all the way around for optimum viewing for both pet and user. It has low gravity which not only makes it more spacious; it is more stable and sturdy for the walks ahead and boasts being able to take any combined or singular weight up to 45 lbs. The panoramic mesh allows breathability and they are also able to be safe traveling for any pet. For added security, there are also seat belt restraints for when it is being used as a travel crate. To benefit further, it has padded straps for when it is being carried and folds flat when in storage. The space provided is boosted with a fully coordinated plush pillow that gives extra comfort and means this multi-functional stroller can be used as a napping space within the home when it is not being used. For the user, the handle is padded so giving more comfort to hands and wrists. This PetLuv Soothing Happy Pet Premium is a mid-high end in the price range but the multi-functionality it offers over-rides the cost. The stability and comfort it provides ensure that money spent on this product is money well spent. The BestPet 4 Wheels Pet Dog Stroller is light, easy and comfortable to use and boasts being capable of both folding and opening in 5 seconds. The stroller is offered in three striking shades; green, classic zebra style and classic leopard skin style. The six-wheeled unit has two sturdy wheels to the rear and two double wheels at the front for easy walking and steering. The beneficial mesh window not only gives full viewing capabilities, it offers top, front and rear ventilation. 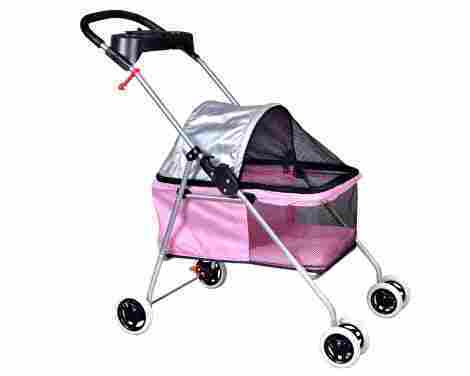 The stroller comes with an anti-ultraviolet sun canopy to keep those harmful rays away from the pets within. The 6.5-inch wheels boast being comfortable and hard wearing, and the ability to use either front or rear entry improves its usability further. 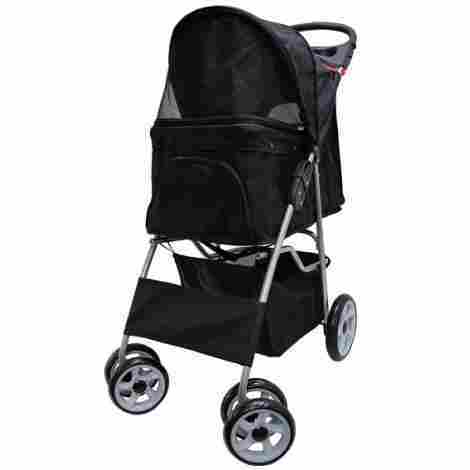 The BestPet 4 Wheels Pet Dog Stroller is manufactured with premium 600g Oxford fabric that is easy clean and durable. The unit boasts an all-around zipper for ease of use and is simple to build and it has storage space for all those necessities when out and about for a walk or even a day trip. This stroller is balanced proportionately when considering both cost and value, the simple build and ease of use makes it an ideal purchase for any potential stroller hunter. The features including the tough material and sun canopy make this a great buy. 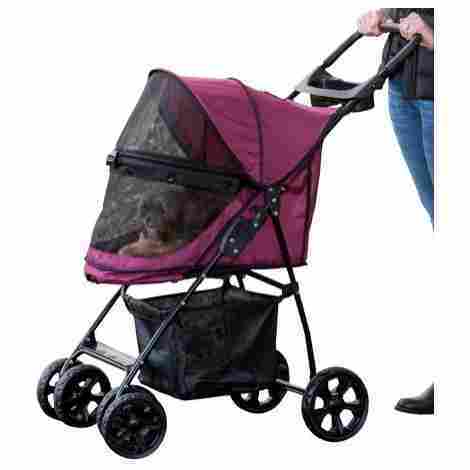 The purple BestPet Pet Stroller uses alternative materials to other strollers which boast giving it longer wearing capabilities. It doesn’t use recycled plastic for its cupholder and this reduces cracking and gives it a much smoother, neater finish. It proffers the use of nylon on the joints instead of plastic, offering a reduced possibility of cracks and fractures with long-term use. It also includes a #8 fiber zipper for added strength and ease of use. 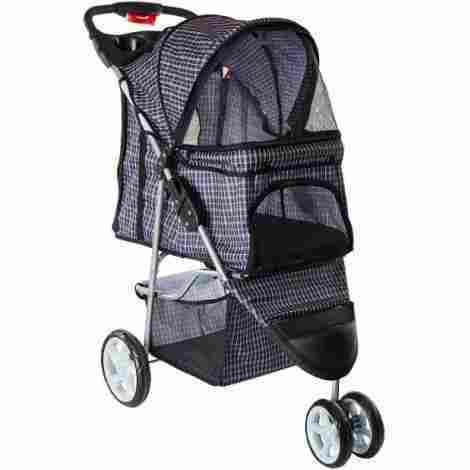 The stroller has mesh to the front, top and rear for improved ventilation and viewing. The front mesh is removable with a quick unzip, and it benefits from a large undercarriage basket for extra storage and a quality cup holder. The nylon joints are combined with Denier nylon for super toughness and durability, and the swivel front wheel makes turning a breeze. The tough design is capable of carrying a weight of up to 35 lbs with ease and comfort for both pet and human. This stroller has some unique manufacturing characteristics that make it great value for the price. The ease of use and functionality mean it can be used as an indoor secure napping place as well as the outdoor walker. Good value for the money. 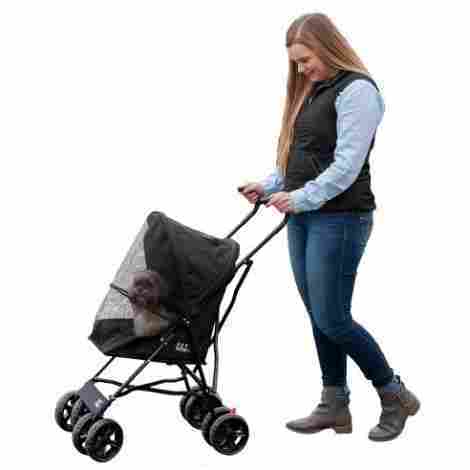 This stroller is neat and compact and weighs in at a mere 9 lbs, it is an ideal purchase for the smaller pet and is easy to take on holiday or simply a shopping trip. It boasts being foldable in seconds and the height to handle is 38 inches from the ground so will not slow trips by being bulky and cumbersome. It is an ideal carry about for a weight capacity of up to 15 lbs and has the bonus of coming fully assembled so no time wasted on fiddly assembly. The Pet Gear Ultra Lite Travel Stroller benefits from the easy locking latch system and is zipper-free for complete ease of use when it’s needed most. It has a fully removable liner for super hygiene and it offers full ventilation with the mesh additions to the hood. The stroller has an easy clean material and boasts strong rear brakes for pet safety. The front entry system is beneficial and is boosted with a top window for easy viewing when out and about. The functionality of this lite stroller is ideal for shorter uses and is super compact when folded. This basic stroller is a great accompaniment to any busy lifestyle, the ease of use and the full practicality of it make it a great value purchase. The safe double braking gives peace of mind for those ad-hoc stops too, overall – a great value product. The VIVO Four Wheel Pet Stroller is available in four stylish colors; black, blue, green and orange. It offers a large protective interior compartment for extra comfort and safety and has easy, quick access zipper points well placed on it. It has a removable screen and a neat little door to the lower side of the front compartment, and on top of that the mesh windows give better ventilation and viewing for both pet and human. The stroller has plenty of useful storage in the form of an undercarriage basket; for all those important extras needed to ensure the most comfortable walkabout. It also benefits from a handy cup holder so drinks are available for all on the trip. This VIVO Four Wheel Pet Stroller is easy to open and fold and can carry weights up to 30 lbs in complete comfort. The two catch system is quick and enables flat storage for the stroller when it’s not in use, this is combined with a further catch to prevent the stroller from dropping open when being transported. The overall cost and value of this stroller are on an equal par, the functionality and ease of use it offers; along with the valuable storage space make this purchase a definite excellent one. The neat folding system and good ventilation add to its value. This product has a lot of storage space. The stroller was designed for comfort. Comes with easy-open and fold technology. Consumers have complained about the quality of the wheels. This stroller offers being both lightweight and comfortable to use with easy rolling wheels. It folds and opens easily and is compact and tidy when in storage. It is available in five striking color choices; red, orange, leopard skin, blue and teal. It has an easy access front for convenience and boasts a removable inner pad for quick easy cleaning. The travel compartment has wide mesh above and below the center frame for ventilation and viewing. This great design offers a multi-functional design, the carrier is easily detached from the frame and can double up to be used in the car for extra safety when traveling, it also folds flat when removed as necessary and so saves on storage space too. The cover benefits from stretching tightly over the carrier and this keeps out harmful rays from the sun and protects from bugs and bites. On those cooler days, the bonnet is fully retractable so allowing for easier temperature control when out and about. The cost and value of this swanky posh stroller are equally balanced, for an easy quick run around, this fits the bill adequately. It has useful features including the removable carriage and this is boosted with the extra cup holder on the top of the frame. The Confidence Deluxe Folding Four Wheel dog stroller has a sturdy set of six wheels; comprising 4 x 2 6 inch front wheels and 2 x 1 8 inch rear wheels. It benefits from a removable soft pad to keep it hygienically clean, and the mesh is situated to the top, front and the rear of the carriage to improve ventilation and allowing snap viewing for both pet and human. It is offered in a choice of colors; red, sky blue, green and pink so should be suitable for all tastes. The stroller has good undercarriage storage, cup holders, and a tray and it benefits from a protective sun canopy for those warmer days. 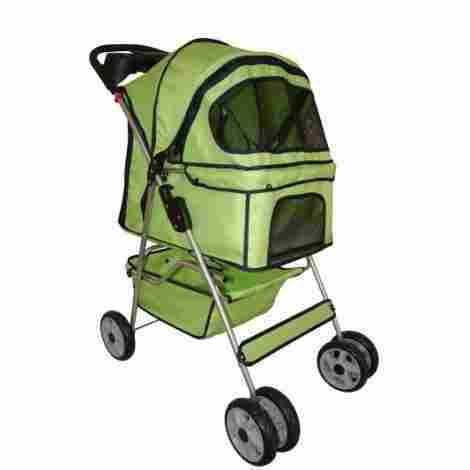 It has foot locking brakes to make sure the safety of the pet is easily and quickly accessed. As well as offering the ventilation needed, the stroller also has a comfortable leash incorporated within the carriage, and the larger wheels maintain comfort on rougher terrains. This stroller will carry weights of up to 33 lbs and itself only weighs in at 10.6 lbs. This VIVO Four Wheel Pet Stroller offers excellent value for money with the features it offers as standard, including the storage, comfort and safety aspects. The overall balance between both cost and value is equal and this is a great purchase for the money. This product has a wealth of space and storage. The protective sun canopy is great for protection. Made from comfortable materials to support a dog. 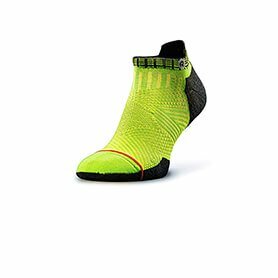 The design includes a ventilated material to enhance breathability and coolness. Wheels can break easily if not taken care of properly. So, you have your best buddy who you believe would benefit from a decent stroller, and there may be a variety of reasons for coming to this decision. You may have been advised this is the way to go by your vet, if your best buddy has health and/or mobility problems there is no reason they should become a house pet. Apart from not really being healthy long term, you also miss out on a great shared time-out for you both, it can be very relaxing for all concerned when everything is getting a bit much. If you have a dog that is stressed or has a nervous disposition; the dog stroller can be a priceless addition to your daily life. You will have the directional peace of mind your buddy feels less stressed, and your dog will doubtless be less stressed when out and about. Busy areas can also be a red flag, you struggle through crowds and the last thing you want is for the leash to either get caught, trip somebody or even come loose. But when you have a dog stroller, not only will you feel happier, your buddy will most likely feel less threatened and nervous. Of course, there is always the possibility you may just want to pamper your best buddy, they may be a smaller breed and you just want to give them a bit of luxury. There are many reasons for wanting a dog stroller, and the choice of strollers available is huge. You may want to bear in mind though, that sometimes a little research into your choice goes a long way, cheaper types do not necessarily mean a lower end product, likewise the most expensive may not be the best at the higher end. The different designs of dog strollers make’s choosing one a little more difficult, so the best way to start sifting through all the possibilities is to decide why you want your stroller and when/where you are likely to be using it. If you want to combine both functionality and convenience, especially if you are traveling by car; then a lightweight compact dog stroller is an ideal choice. They are designed to be light and fold neatly to fit into the boot of your car without taking too much valuable space. Not only this, but they tend to be smaller in dimension too so won’t restrict you too much when you have to maneuver busy streets and shopping malls. For the more adventurous of you, you may like to take your dog away with you on hiking or walking trips, then there are specifically designed strollers for multi-terrain use. Similar to standard strollers, they have features that make harder, uneven and difficult terrains to be accessed with little fuss the wheels are going to be shocked off. These are useful if you fancy taking your buddy on your daily jog with you but know they won’t be able to do the distance. You can take the lighter stroller along so when your buddy gets tired, they can hop into the stroller so you can finish your jog without worrying about them. 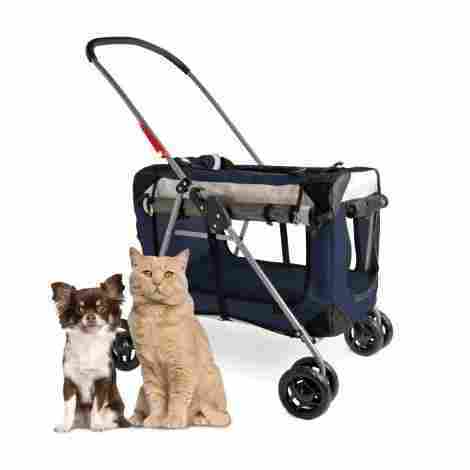 If you have more than one furry friend you want to provide for, this has been taken into consideration too, you can purchase tandem strollers in many different guises. They may be side by side doubles, front/rear tandems, top and bottom tandems and some may even be convertible from one comfortable space to two with minor adjustments required. There are some obvious features that you need to think about when you are looking for a decent dog stroller, it needs to be functional, safe and appropriate for use. Decent wheels are a must, it’s no use spending a small fortune on a stroller if it has substandard wheels. They need to be strong, robust and light in order to be able to overcome daily stresses and strains when being used. Dog strollers can come with double wheels, four wheels and three wheels – where you will be using it should determine to an extent what type of wheel placement you should purchase. Some will have a harness built in for the safety and security of your best buddy, the last thing you want is to hit the rough ground and they are sent flying out of the stroller. Many will have covers of some description, mesh covering is especially useful for reducing insect infestations or if your dog is a shy and prefers a little cover. There are also rain covers which can be easily attached or removed for those inclement temperatures and weather conditions. One thing you may want to consider when you are shopping is the fastening of the covers. You may prefer a quick Velcro closure, or snap closing which is still suitable for quick access and entry. Zippers are really handy as long as you check the quality before you buy, these are good for use in wetter, windier climates and will help to prevent leaking and draughts. Other features may include shock absorbers for the hardier terrains, this will be more comfortable not only for your dog – but also helps to reduce stress on your wrists and arms as well. Storage pockets or pouches are very handy to have when you’re out and about, favorite toys, leash, drinks, food/treats and scoops/bags are all things that are useful to take along with you for practical reasons. When you’re looking for the perfect dog stroller, you want one that can handle everything you can. New techniques in design have improved the basic dimensional qualities of a modern stroller, they are, more often than not ergonomically designed for healthy comfort. The seats are produced for maximum comfort for your dog, and the wheels are better placed so that you won’t be kicking into them when you pick up speed or even on a normal walk. Many can be erected with one hand and may have easy folding mechanisms. A great bonus with some is the integrated carriage that can be lifted away and used as a secure carrying compartment when traveling in the car. Just as you would consider quality material for yourself, you should place the same emphasis on the quality of your new dog stroller. It may be an easy option to buy the one that’s in the reduced or end of the line section, but pay attention to the quality before you buy. Modern materials are technically advanced and are hard wearing, tough and flexible. They may cost a little more but in the long run (no pun intended…) you will be spending your hard-earned cash in a more cost-effective way. You should also pay attention to the weight of the stroller on its own, and don’t forget to add the weight of your dog – then, and only after you have also taken into consideration the uses you have intentions for; you should buy accordingly. Modern lightweight stainless steel and aluminum are not only practical but can withstand many years of use if they are used correctly; so it’s worth taking time to choose carefully. Q: Can I use my child’s old stroller instead of buying a new dog stroller? A: It isn’t recommended because the designs are different, dog strollers are developed specifically for keeping your dog safe and comfortable. And if you walk them in a child stroller it will be uncomfortable, unsafe and won’t provide simple needs for your dog when you are out. The overall designs are so your dog can sit comfortably and have a great view to boot. If they are in a child stroller they will be in an awkward, un-natural position and they will be restricted in ways they won’t be happy with. Q: Are three wheels better than four? A: That depends entirely on when and where you intend to use your stroller if you want it for running with three-wheelers will probably be a good option. Like-wise for day to day use a four-wheeled option as this may be more practical, either way, make sure you have a correct stroller for your dog’s weight, the terrain and your own capabilities of handling it when you go out. Q: Do all dog stroller come with rain covers? A: No they do not, you should check the individual product specification when you are shopping, and remember if the one you want doesn’t come with a cover included – there are options to purchase covers separately. Q: Do the strollers have inbuilt harnesses? A: Again, this depends on the choice you make, but most will at least have a tethering clip or function so you can attach your dog leash to it to avoid any accidents. Q: How long can my dog be in the stroller? A: It is not advisable to leave your dog in the stroller for long periods of time because this can lead to discomfort and possible distress. You should take care in the heat as well, as hot weather can be dangerous whether you are walking your dog or pushing it. Q: Is using a stroller ok for my big dog? A: That depends on two things, the first is the weight of your dog, and of the capabilities and any weight restrictions on the individual stroller. Always check the stroller is suitable for the dog that is traveling in it. Q: Can I take my dog stroller on public transport? A: That will depend on where you live and what type of transport you intend to use. It is always best to check with the transport provider you want to travel with as this can vary not only from state to state but also from company to company. WebMD, Dog Strollers: A Do or a Don’t?